Wow. I'm too pooped to say much more, but I had an amazing time. The OtakuBooty meet was a lot of fun, and partying with OB people on Friday and Saturday night was 100x better. If you haven't joined the site yet, join now - this group is a lot of fun. 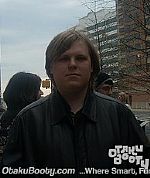 These are the pictures from various debauched OtakuBooty gatherings and parties only. Tomorrow I'll put the pictures of various costumers up. ...LOOK AT DOC WILCO'S FACE!